My County (Jämtland, Sweden) is far removed from the general production activities of the movie business, but there is nevertheless a very interesting histoy to look back at if you are a serious movie enthusiast. Author Fredrik Alverland is such an enthusiast, and because of him we now have this beautiful 228 page book about everything that has happened over the years in these parts. “Viddernas landskap på vita duken” (Förlag 404, 2013) is a fantastic journey into a past that has been far more prominent than I had thought. I knew of a classic WWII movie that was partly shot here, “The Victors” (1963), but Hollywood has been here again and again through the years, for certain key scenes in movies (what we have got is an incredible nature, so I can understand the reasoning). Among the more interesting films (in my book) we have classics like “Custer of the West” (1968), “Monte Carlo or Bust” (1969) and “The American” (2010, hence George Clooney on the cover, photograph taken by Giles Keyte on lake Storsjön, The Great Lake). Many Swedish films have also been shot here over the years, going back to 1909. The book also features chapters and interviews with local actors and people that has been involved in movies. Ann-Margret the prime example (although she has lived in the States for most of her life). This is a book to be proud of if you live around here and it has “instant classic” written all over it. 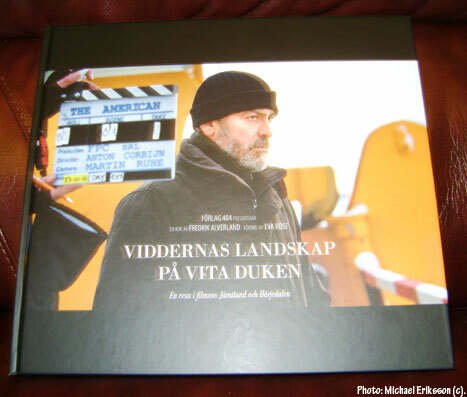 Any fan of movie history in Sweden will find this a very good read. I called Fredrik today since I wanted him to have the latest issue of RETROFUTURE (he is a journalist, we first met back in 2010) and I commented on a recently published interview about this book that I had seen. He then told me that he had been meaning to give me a call and that he wanted me to have a copy. A quick exchange a few minutes later resulted in me having a copy of this book and I had asked him to sign it (many thanks!). I was also hugely surprised to note that my name popped up in the credits list (“Michael Retrofuture Eriksson for inspiration – rock on”). Very nice. The enthusiasts are the ones that get things done proper.